Wow, I'm such a slacker mom! The last time I took a pic of my kids was Easter. And we haven't had professional (aka WalMart) pics taken since Jason was 1 month old. I keep telling myself I need to get us all nice looking and run to WalMart for some nice family pictures, but we never get around to it. Jason is being so cute this morning. I was going through boxes in the nursery and found a Cars hat and a little backpack of his and he was excited to have them again. So he's wearing his hat and backpack and telling me he's going to school. :) And he just looks so adorable. Jakey is not being so cute. I woke up at 5am to the sound of him gagging and throwing up. Yuck! Not what a preggo mommy needs. I about threw up but managed to get him cleaned up and sent him to lay on the couch with Hubby for a bit. I didn't get back to sleep and half an hour later he came back upstairs so I decided to at least get a shower since I wasn't getting any more sleep. He seems to be fine now at least, so I hope it was just a fluke and he's not getting a tummy bug or something, especially cuz I've planned to have a bunch of friends and their kids over today and don't want to have to cancel. So, I did not get anything on my to-do list done today. I may get dishes done before bed, but I make no promises. This means that tomorrow I'm going to be rushing around trying to get my whole house clean by noon, plus making the Oh Henry Bars. I didn't even go get chocolate chips like I needed, so I may send Hubby for them when he gets home. He went golfing after work today. The day seems so long when he doesn't get home until later and the boys really wear on my nerves. They are up in their beds not sleeping right now :P Maybe when they finally go to sleep I will clean a bit. I was watching TV earlier and saw a commercial for this steam cleaner that I really wanted. I don't remember what it was but they were cleaning a cushion or something and it looked great. Everyone I know who has a steam cleaner loves them, especially if they have pets and/or kids. I know my kids are always spilling stuff on the carpet or couches and I think a steam cleaner would be much better at getting up some of those stains. I hate my face. :P Every day a new pimple pops up. I normally don't have a big acne problem, but when I'm pregnant it just goes crazy, especially around me mouth and chin. And I don't really have any acne solutions except for a little Mary Kay tube of acne cleanser or something, and I don't think it's helping. And I swear the more I wash my face the worse it is. I don't know why that would be. Oddly, my coverup seems to clear it up better than anything lol. I can't wait for this phase of pregnancy to pass. I'm thinking I need locks on every door in my house to keep the boys out of things. Especially the bathrooms. They get in there and dump out bubble bath, flush whole rolls of toilet paper down the toilet, stick toothbrushes in the sink drain, etc. It drives me nuts! I also have a cupboard in my room for personal items (babydolls, lingerie, etc) that they love getting into and strewing around. Not fun when company comes over and I suddenly realize some lacy underthing is laying out. We already have to have locks for the pantry, fridge, and most of the kitchen cupboards and I really wish we had locks for the dishwasher and stove. They get into everything! Today they have kept getting into the closet in the nursery/Jakey's room. It's full of baby stuff and they keep getting it out and making a mess. I don't know any way to lock it either, unless I try tying the knobs together. Sigh. Kids are so curious. So, I haven't done anything on my to-do list yet. Not a single thing. But I did get the nursery cleaned up so we could put Jakey in there. We were planning to keep him and Jason in the same room, but it's getting to the point where they won't go to bed at night because they keep each other up playing. So we decided to move Jakey into the nursery and see if that helps them both go to sleep better. I also haven't gotten around to the garden yet today. But I think I'm going to get the boys dressed and go out now. They are driving me nuts and I think some fresh air will help. ETA: Well, it got really windy a few minutes after we went out so we had to come in, dirt was being blown in my eyes and I was seriously afraid something would get blown into our yard and hit us, it was sooo windy. I think today I will finally get around to weeding our garden. We have a little raised bed in the backyard and I want to plant some tomatoes (hopefully this year they will actually grow lol) and maybe some corn. And Hubby says there are already strawberry plants so that would be nice. But right now it's full of weeds. Since it's supposed to be warm today I think I'll take the boys out and let them play while I weed. I better ask Hubby where the gardening gloves are. And hopefully it won't be too windy. I hate that the warmest days here are so windy lol. I should have done it yesterday when it was warm and not windy. And I think I'm going to see if our library has Gardening for Dummies or something because I really am not good at it and I don't want my garden to just die. Oh, and I guess I need to buy some nice gardening soil/mulch stuff to dig into the dirt. I wish I could till up the dirt but first we don't have a tiller, and second it's a narrow garden bed and I don't think it would work well lol. So old-fashioned digging will have to do. Let's see, what do I need to do today? Tomorrow I might be having some friends over again so I need to get my house cleaned up. I promised to make Oh Henry Bars again too cuz they were such a big hit last time, so I need to get some chocolate chips so I can do that. I mostly need to get the bathrooms clean and the kitchen mopped. And the playroom. It gets so messy so quickly. I need to get some new storage bins for the toys, the boys have destroyed the ones we have by standing on them a lot. Maybe we'll head to the dollar store for that. Happy Monday everyone! Welcome to Menu Plan Monday from Organizing Junkie.I love having a weekly menu plan to follow. It makes my life so much easier. And it's not set in stone either. If something comes up or we decide to switch it around a little that's fine. But overall it works wonders and I am much better at getting good dinners on the table. (OK, Hamburger Helper may not classify as a "good dinner" but it's better than having nothing and just eating donuts and hot chocolate or fast food lol). This is a picture from last year at the zoo. We went with my friend Michelle and her girls. This peacock was sitting on a roof by the bears and I thought it was too pretty not to get a pic. I think I liked it more than the kids did lol. 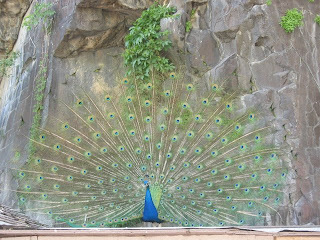 I love peacocks cuz their feathers are so pretty and this one had it's feathers fanned out all the way making it a great site. Wanna see more pics of animals? Check out Camera Critters. So last night I gave in and let Hubby buy a Wii. Only because we actually had the money for it right now and he'd won a Best Buy gift card at work. He didn't end up buying it from Best Buy because there shipment comes in tomorrow and he didn't want to break the Sabbath. Instead he bought a new one from an online classified and went to Best Buy to get a second controller. Then Monday he's going to Best Buy to buy the new Mario Kart to go with it. I'm very excited for that, we love Mario Kart. Right now we have the Wii Sports game that came with it, and Wii Play that came with the other controller. We've been playing lots of tennis and it is a ton of fun. And today my right arm is so sore! I'm not used to this much workout with me arms. And the boys LOVE it. They have no idea what they are doing and aren't at all good, but they have fun doing it anyway. I'm so excited! I entered a ton of giveaways this week at the Bloggy Giveaways Carnival and I actually won something this time! There were over 900 giveaways and I entered probably 1/3 so I'm glad I actually won or I would have lost all faith in random drawings lol. Anyway, the awesome prize I won is a stylish apron from The Quilting Nurse! This is great because I don't own a single apron and have been wanting one for a while, cuz I can get pretty dirty while cooking and baking. Yay for me! My boys gave me a great gift today. They slept in until almost 8am! That is almost unheard of from them, they usually wake up around 6:30. Which meant I got to stay in bed until they got up and was able to get a bit more sleep. It was so nice! And they were happy and mellow this morning, and I was definitely happier lol. Hm, it suddenly got very quiet upstairs, better go see what they are up to! - I will not vote for Hillary Clinton in any election. in the morning I'm still exhausted. I try to be in bed by 10pm and get up at 6am with Hubby's alarm. So I had an orthodontist appointment today. I have to drive almost 2 hours there and then back, which usually really stinks. Today wasn't too bad though, the boys slept most of the ride there, behaved during the appointment, and were good on the ride home thanks to the 30 miles of road work that provided lots of eye candy ("tractors!") for the boys. I also brought snacks and water to help me pass the time. And the appointment wasn't too bad. There is one tooth that we are having trouble getting moved. We are trying one more time and if it doesn't work then we are going to call it quits on that tooth which means I'd be done sooner. I'm not sure if I now hope it finally works so we get that tooth taken care of, or hope it doesn't so I can get these dang things off sooner! Either way, I'm really hopeful that they will be off by the end of the year. After 2.5 years, what's a few more months? Today I am thankful for my sister-in-law who is awesome and my boys love her. We went to her this morning to get the boys haircuts. I am thankful for good sales too, we bought about 25 boxes of cereal last night on sale and saved a ton and won't have to buy cereal for a long time. And I am very thankful that our pantry has a lock to keep the boys out and that I put a lock on our fridge. Now I don't have to worry about them getting into everything lol. Well, no nap for me today. I guess the boys were really tired cuz they both fell asleep watching Tarzan, Jakey was laying down with me. But I can't sleep with any noise so I just lay there watching the movie and resting a bit. I really need to clean up the family room still, but all I want to do is lay down lol. I better go see what the silly boys are up to in the kitchen. Oh and if you haven't checked out 5 Minutes for Mom's 2 Weeks of Toys Giveaway, head over there now cuz it ends today! Well, I didn't get as much done yesterday as I'd wanted. OK, I didn't really want to anyway, but I should have lol. I still need to clean up the family room and vacuum. And unfortunately I didn't get a nap, Jason won't nap often anymore. :( And I have more dishes to do. And the playroom we spent over an hour cleaning up yesterday is a junky mess again. Sigh. I really hope that I can at least get a nap today, I need it. * Clean Playroom Done! except for vacuuming but it looks much better. I'm going to go throw the boys in the shower to get them cleaned off (they love the shower) then put them down for a nap. Hopefully Jason will nap today, cuz I want to lay down for a bit. Then after naptime I need to get dinner started. So Saturday we went shoe shopping for jason. First we stopped at Payless. They were having a buy 1 get one 1/2 off sale so we were going to get both boys new shoes. we found a pair that Jason just loved. He put them on and started doing some little funny break dancing and was so excited, telling me, "Mom, look! I can dance in my new shoes!" It was so cute. But. We went to the section that was Jakey's size and there were no sneakers in his size. A bunch of sandals but that's not what we wanted. So we had to break Jason's heart and put his shoes back and headed to Target. That was even more of a bust. They had nothing for a good price in either boys' size. So we decided we would go home and try again another day. The boys were not happy with that plan. On the way home though we decided to stop at another Payless to see if they maybe had what we needed. And luckily we didn't disappoint the boys again. The store had those shoes that Jason loved in both boys' sizes. All Jason has been able to talk about since then is his new "big shoes" and he excitedly tells everyone about them. Funny boy. Happy Monday everyone! Welcome to Menu Plan Monday from Organizing Junkie. I can't say enough how having my menu plan has saved my sanity. We used to be scrambling for something for dinner and ended up eating out more than we should, but ever since I made up my monthly meal plan it is so much easier to get dinner ready and go shopping. Jason keeps telling me he wants shoes with wheels. He got this idea from all the kids skating around on those skate shoes, Wheelies or whatever they are called. I keep telling him no, but almost every time we go to WalMart he tells me, "Mom, you need to get me shoes with the wheels." I can just imagine him falling on his backside many many times until he breaks an arm. Definitely a no for a 3.5 year old lol. I told Hubby we are not getting him any until he can earn the money and buy them himself. I'll provide the necessary regular shoes, but indulgences like that can wait until he can get it himself lol. Oh, and we did buy the boys new shoes yesterday, which I will post about tomorrow or something, cuz Jason was so funny about it. One day I really want to get a new Honda Odyssey with all the cool features, like OnStar and navigation system and power everything. I'm really interested in the OnStar system from all the commercials I've seen. It can help if you get in a wreck or get a flat tire and stuff. A few days ago on the news I was watching a live car chase (I love watching car chases for some reason) and they were able to track down the SUV because of the vehicle tracking GPS thing that OnStar had in the vehicle. Even if the police and helicopter had stopped following, they would have been able to find the SUV at any point. Pretty cool stuff. I think there are more commercials on at night. I'm sitting here listening to the TV in the background but I don't even know what's on except that it has to do with the NBA, because most of the time is taken up by commercials for life insurance, fast food, car sales, flea control for pets, and all that. It's like the all-night commercial channel or something :) Maybe that's a sign I should be in bed lol. Some days I really wish I had a magnifying glass. Last week we had 3 of our glass cups broken in one day. Yep, 3 in one day. One by a cat and 2 by Jakey. Luckily nobody got cut from the glass, but Jakey walked through it and I hurried and scooped him up and made sure to get as much of the little tiny shards off his feet as I could (as well as my own). A magnifying glass would have been so helpful. I had to just hope I got all the pieces out cuz I know how those tiny little glass slivers can hurt. He went on with his way happily and never complained of his feet hurting so I think I got it all. Fun times I tell ya. So, this isn't a living critter, and not one you'd want to see living really lol. But I thought it still counts. Here's my boys under the T-rex statue at the Dinosaur Park a few weeks ago. I was surprised I even got them to sit that close, they were terrified when they first saw the dinosaurs and started crying and screaming at the one inside that moved and made noise. So I was happy to get this pic of them with the T-rex. You can join in Camera Critters every Sunday too! It's lots of fun. Ugh, we have had too much candy in this house lately. First there was Easter, then there were the after-Easter candy sales. Then Cosco had a coupon for boxes of candy bars so of course we had to buy one, and picked up a giant bag of M&Ms with it. Then last week Albertson's had some sales on cereal and fruit snacks and stuff and Hubby got us 3 boxes of Gushers (Mmmm, yummy!) and 3 boxes of fruit snacks. In 5 days they have all been eaten (mostly by me, I admit). I'm going to need some orovo detox pills or something at this rate! I really am trying to eat better, and at least I am drinking more water, it's just hard when nothing sounds good and I need to eat a quick snack lol. I'm finding it harder to get comfortable in bed these days. I think since this is my third kid my joints are starting to loosen up earlier than in previous pregnancies. My hips and knees especially ache when I'm laying in one position too long. I'm glad that at least this time I have a memory foam mattress pad on top of my mattress that helps cushion a bit more. Now I just need a stack of pillows I can position around me however I need. Today was such a nice day. It got into the 70s so it was sunny and warm, but it was also pretty windy so we had a nice breeze. We spent a lot of time outside, letting the boys play, and Hubby did some yard work. Hubby got sunburned becuase he doesn't like sunscreen. They boys and I spent most of the time under the covered patio so we aren't burnt. Then we spent the evening grocery shopping and buying the boys new shoes cuz their's are getting tight. Now it's past their bedtime and I'm exhausted too, so I'm going to get them to bed and hope they go to sleep quickly. - Before I started driver's ed, my dad let me drive a little bit. I remember him pulling over and letting my get behind the wheel to drive a few minutes. I was terrified and had a hard time staying in my lane. - Nobody. I'm way too tired to want to spend the night out for anything lol. No musician is more important than my sleep. - A, there are 4 total. I am still sick today, and very tired. I couldn't fall asleep until 1am this morning :P And then Hubby stayed late after work to go golfing and didn't get home until after the boys were in bed. But, to make up for leaving his sick tired pregnant wife home alone with the kids all day, he brought me home Subway. And because Subway is one of the few things that always sounds good to me right now, of course that makes up for it all :D It was so yummy. Hm, I should have had him get some double chocolate chip cookies too. Oh well, next time. :) And now the boys are in bed and I'm going to head to bed soon, after taking some Tylenol PM to help me sleep. I am thankful for the break from nausea that I had last weekend. From Thursday through Monday I felt pretty good. And I'm very thankful for the beautiful weekend we had and that we were able to get out and get some sun. And it's supposed to be pretty nice today and tomorrow too, so that is great. I feel so yucky today. I woke up with a very sore swollen throat, I could barely swallow, and a runny nose and major headache. And that's on top of my normal pregnancy nausea and exhaustion. Just sitting here is wearing me out. I'm going to try to get the boys to nap now, a little early, so that I can lay down. I need them to nap so bad cuz I might not make it through the day otherwise. I love to shop on Amazon, half.com, buy.com, and some other sites for books and DVDs, I can find what I want used or new for great prices. You can use Ebay too, but you usually have to wait days for an auction to finish and you might not get it or the price keeps going up, so I usually don't bother lol. Another thing I like is when you buy stuff they come up with lists of other stuff you might be interested. There are tons of places like this online too, like buy.com, and you can find books like Reconciliation: Islam, Democracy and the Westy by Benazir Bhutto that are new for prices better than you would in the store. See, that's at least something :D And I am going to do a few loads of laundry. I have to if I want clean towels and something besides PJs to wear tomorrow. Actually I don't even have anymore clean PJs, so if I want to wear anything I better do some laundry lol. Today's Heads or Tails word is Heads- Tip or Tails- Anything that rhymes with tip. So let me think, here's some stuff about things rhyming with tip. Zip- I have a pair of black pants, that I wore yesterday actually, but the zipper is broken. It drives me nuts cuz I have to make sure I wear a shirt long enough to cover it up. Trip- Jakey always trips when he runs, it's so funny. He gets excited and starts running for something and forgets to watch where he's going. At least he's not as bad as Jason was when he was younger, he always managed to trip right into the edge of the coffee table. Every. Single. Time. Poor kid looked like he'd been beat. Lip- I'm sitting here watching VeggieTales (why I still have it on after the boys went downstairs to play I have no idea lol) and am reminded of one of their silly songs called "I Love My Lips". It's nice to have a fun cute cartoon I don't mind myself my kids watching. Flip- A week or two ago some ladies from church came over as a kind of meet-the-new-lady thing to get to know me better. Jason was telling them how old he and Jakey are. He put up 3 fingers and told them he was three, then told them Jakey was one. Guess which finger he used to show 1? Yep, he flipped them the bird. Good thing they understand little kids don't know any better lol. Well, that's about all I can think of right now, I better skip to the kitchen and whip up some lunch. Hehe. So today is the deadline to file your taxes! Who out there is rushing around to get them finished in time? Not me! We got our federal return done in February and used up all that money already, paying bills and stuff. And last week we mailed off the $23 we owed to Idaho. So we are all done until next year. We were a bit disappointed in our refund this year, but it was because we had almost $20k in untaxed money we received from my paid blogging and money Hubby won, and we had to pay the taxes for all that. I was actually afraid we'd end up owing, but thanks to our two cute little tax credits we got a little return. And next year will be better cuz we will have another cute little credit, and it's doubtful that Hubby will win $10k again this year lol. I love when stores have case lot sales or 10 for $10 and all that. Today I sent Hubby to the store for a bunch of stuff on sale at Albertson's. We saved over 50% for stuff like cereal, ketchup, artichokes, pudding, and a few other things. And of course the thing that we actually did need immediately was milk, which he bought, but it somehow didn't make it home. Somewhere between checkout and the car it got forgotten. So he just got back from running back to the store for it. So I may have underestimated the extent of our sunburns. Except for Jason. Because Jason kept his jacket on half the time we were out, he has no burn at all, not even his face or ears. Poor little Jakey looks like he painted his face pink and his forearms are red too. And my arms are burning! They hurt so bad and are bright red, doesn't help when Jakey wanted to lay in my lap and kept wiggling around in my arms. I'm sure my face is a little burnt too. Serves me right for forgetting sunblock. I will definitely be slathering myself and the boys before we are out that long again. At least I won't have to worry about doing that tomorrow, because it's supposed to be in the 40's with a chance of snow. Yep, after our beautiful day in the 70's and sunny, we might have snow tomorrow. Stupid weather. But at least this weekend is supposed to get sunny and warm again. Today is the nicest day we've had in a long looooong time. It's in the 70's and sunny, though quite windy. This morning we headed to SIL's work to get my eyebrows cleaned up and hang out, then we stopped at the library to try to find a dvd we misplaced and get some more. My neighbor let me know that her and some other ladies from church were taking their kids to the park around noon, so we went too. The boys had lots of fun and I got to get to know some of the ladies a little better. Unfortunately I didn't put any sunscreen on any of us and after 2 hours in the hot sun we are all a little sunburned. I missed my mom coming over to visit while we were out cuz I didn't have my phone with me, I felt really bad, it was her first visit since we moved in. I might take the boys over to see her tomorrow. We are having hamburgers for dinner so I think I'll have Hubby fire up the grill to cook them and we can eat out on the patio. It's great cuz it's covered and we can put down the side curtain things to block the wind, but still enjoy the warmth. What a beautiful day. This goes along with the saying "Home is where the heart is". Wherever the things you love most are, that is home. For me, as long as I am with my family then no matter where we go, I am home. It's not the place, it's the people. Where is home to you? 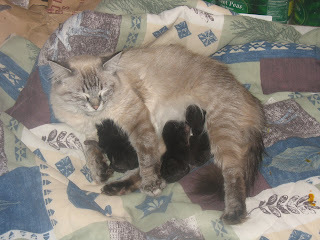 My picture is of our cat Stars when she had her kittens last year. It was a surprise for me because I thought it would be another week before she had them, but one morning I went down and found 4 tiny black kittens there (you can't see one in the pic, the runt is under her front leg). We no longer have any of them, but MIL took the runt so we get to see him when we are there. So here's Stars with Devil, Tiger, Junior, and (unseen) Monkey. Today was such a nice day! It got up to around 60* so we did some yard work and the boys played in the backyard. Then 3 of my brothers and my SIL came over and we went across the street to the school to play. The boys played on the playgrounds a bit, and ran around, and we played frisbee and flew a kite. It was so fun. I haven't flown a kite since I was probably 10, so I enjoyed that lol. The wind kept blowing the frisbee over neighboring fences and my brother had to jump them and go get them, until finally it ended up on a roof and we just said forget it. I'm so happy the weather finally seems to be warming up. Monday it should be in the 70's, which will feel so nice! We'll probably go play on the playground again. The boys love when we can get out of the house. If we'd stayed at our last house longer one of the things I would have wanted to change was the painting on the trim around the house. It was old and faded and I'm not sure what color it was originally, but it looked brown. It looks so nice when a house has a nice fresh paint job and especially if you have a good color for the trim, exterior shutters, and all that. But we moved and our new house looks fine, so now I don't have to worry about it. :) We just get to find other stuff to change. Today I went out and pruned the huge rosebushes on the side of the house. They were way out of control, so I had to trim quite a bit, hopefully they grow nicely this year. And those things have some nasty big thorns! I got a cut on one of my fingers that was bleeding all over. So here's a funny story about me :D Last year I was thinking of getting family members personalized gifts, so I was looking at Etsy shops (I think?) and just searching for stuff with their names on them, like shirts or purses or whatever. My little sister's name is Kelsey. After an hour of looking at stuff with her name on it though, her name started to look really weird like it does when you say a word a lot and it just sounds funny. Well, I began second guessing if that was really her name! LOL, I was so confused because I'd been looking so long that it just didn't even sound like a real name. I even started asking myself, "Wait, is that her name?! What else would her name be?" LOL! I don't know what else I thought her name might be, Delsey, or Kiley, or something lol. I told Hubby about it later that day and he just laughed at me. Anyone else ever done something so silly? Man, I am exhausted! I've been cleaning and cooking all morning. I just need to sweep (and maybe mop) the bathroom floors and vacuum most of the house. The O' Henry Bars are done (and very yummy!) and my friends should start arriving in about 45 minutes, so I better get finished with the cleaning and wash up the kids a bit. Looks like I need to sweep the kitchen again, the boys have left sandwich pieces from lunch all over. Today I am thankful that tomorrow I get to meet up with some friends, it's going to be so fun. And I'm making O' Henry Bars, yummy! I'm thankful that I was able to get my house clean, it feels so nice to have a clean house. And I'm thankful that today I didn't feel to sick, or maybe I was just too busy cleaning to notice lol, either way I feel pretty good today. Boy, I've been cleaning more today than usual. Why? Because I invited people over tomorrow and that is the best way to get me to clean lol. Some friends from one of my messageboards are getting together at my house. I've met a few of them in previous get-togethers, but a few others will be my first time meeting them in real life. Should be a ton of fun. But I'm exhausted, and I'm not even done yet! Plus I have to keep it clean until tomorrow lol. The boys weren't too bad. Except for the poop on the bathroom floor and downstairs counter, juice and water and food spilled on the kitchen floor, and all the other messes they make. But really, it wasn't too bad, I guess I had more patience today than normal. Man, my computer really annoys me sometimes. A few months ago we went through a time where it wouldn't load pages or pictures most of the time. Eventually we got it taken care of so it worked fine, but now it's doing it again. It started a few days ago and I have to keep reloading pages to get them to load, and a lot of pictures just won't load at all. It is so annoying. What's the point of having cable internet if it takes just as long to load a page as it would if I had dial-up? :P I really think it's a problem with Vista or our wireless adapter. We also have the problem that usually once a day the internet just stops working and we have to restart the whole laptop to get it to work again. Not cool when I'm in the middle of something online. I get to clean the house and keep the kids from making too many messes, so fun day for me too lol. Actually I'd prefer to be here instead of a ride-along, I don't think I'd enjoy it much. * Take a nap. The boys are laying down now, as soon as they are asleep I'm going to try to nap. * Make dinner. I can't even remember what we are having tonight lol. I have a feeling Jakey is going to be potty trained a lot faster than Jason was. Lately he's wanted to take off his diaper and sit in the potty. He still goes in his diaper, but he also goes a little in the potty. It would be so nice to have him out of diapers too before the baby comes. Jason's still not fully trained, he still poops in his underwear. We also keep a diaper on him at night, not quite ready to risk the messes at night lol. Yesterday we got a magazine in the mail called Salt Lake Living. This is one of those magazines that show upscale homes and how to make yours look like that. There are some gorgeous homes in there with pools, fiberglass columns, drool-worthy kitchens, and all that. It's really good for getting ideas for stuff we'd like to update in our house. Makes me want to get renovating. Wow, the house sure is quiet when the kids aren't here! Jakey is napping and my little BIL took Jason and his cousin across the street to play. Hubby is outside trying to fix a sprinkler pipe and MIL is not noisy lol. So it's nice a peaceful and quiet for now. Just me and the TV :) I better take advantage of it and lay down for a quick rest. - Um, I have no idea, I'm not good at this kind of thing lol. - I can't think of someone right now, lots of singers have wonderful voices. - I like poetry, sometimes I like to write it. - When my boys made a mess with Taz, posted a few posts down. So, like I figured, morning sickness has started to kick in this week. It did around the same time with my boys so I was sure it would. So far no throwing up, just feel sick to my stomach all day and food all sounds disgusting. Hopefully it stays as easy as I had it with the boys. It would be nice to be able to eat though lol, even stuff I normally love just sounds so yucky and usually makes my stomach hurt more. I remember last year I saw something on the news about North Carolina, especially Wilmington real estate, was one of the best markets for selling homes in the country. With the recent credit and mortgage problems causing housing markets to fall, I wonder if it is still the best market. They were showing how house flippers were making big bucks there, which is what caught my attention cuz I think it would be cool to flip houses, you just need to be in the right area where you can actually make money on it. Anyone else watch UFC (Ultimate Fighting Championship)? My brothers got me into watching it and I really enjoy it. I've never liked boxing or wrestling or whatever, but these mixed martial arts (MMA) fights are so cool. My brothers are over here tonight to watch and now we are watching Ultimate Fighter, the reality show based on UFC. It's interesting to see the fights of the amateurs compared to the fights we just saw with the professionals. My little sister spent the night here last night. It's the first time she's been to our new house. I love it when she is here because she is such a big help. This morning she helped us clean up the boys' pigsty playroom. I'm tired and hopefully I can get a nap today, I might see if she will keep an eye on the boys while I lay down for a bit. We have no plans for the day, just hanging out. Sounds like the boys are already messing up the playroom again. It's an impossible job to keep that room clean lol. I do need to go through it and put away some of the toys in the storage room so there isn't so much to make a mess with. My kids always slept better as babies when they were swaddled. Jason loved it and he was swaddled until he outgrew all the blankets, I think around 6 months old. Jakey hated it. Although he slept better he just did not like being all wrapped up and always managed to wriggle his way out. I would wrap him in a receiving blanket then in a Swaddle Me blanket, with a safety pin to keep it closed, and at 2 months old he would still wriggle his way out. I finally gave it up around 4 months old with him. I always wanted to try one of those special swaddle blankets that people swore by. My friend Amanda is having a giveaway for an adorable baby swaddling blanket and gift certificate from Ju Ju Beane Boutique. I'd love to get this very cute swaddle blanket. No, that is not snow covering my boys and half the bedroom. Apparently Taz has developed a large hole on his face and the boys have enjoyed jumping on him and making the snowy white beads fly out all over the place. And of course when I tried to clean up the boys they ran all through the house with a trail of fluff falling off them, so I have tiny white beads all over the place. Taz has been retired to a kid-free zone, the storage room. I finally got the kids to hold still so I could vacuum most of the styrofoam off them. It's been a few months since I've joined in Heads or Tails but I figured it was time to jump in. This week's HoT word is Fool. Seeing as how it is April Fool's Day I'm sure many people will be talking about pranks they've pulled or what they have done to fool others. But not me, I've never been good at April Fool's jokes.